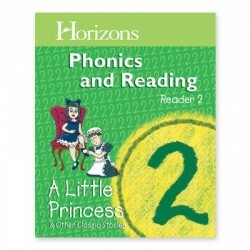 Give your child the keys to reading success with the Horizons 2nd Grade Phonics & Reading Student Reader 2—A Little Princess & Other Classic Stories. Eighty phonics-based stories include A Little Princess, The Wolf and the Goslings, and more! Use as a companion resource to Horizons 2nd Grade Phonics & Reading Student Book 2.